Kick off those flip-flops the minute you get there. Stop for beachfront eats in between sun sessions. Trickling fountain, colorful blooms - the garden area is a feast for the senses. As the Mexican inspiration for the decor, San Miguel would be proud. It's an 18 minute drive to all the shopping and dining options at Las Olas Boulevard. You're only 15 minutes away from the Bonnet House Museum and Gardens. 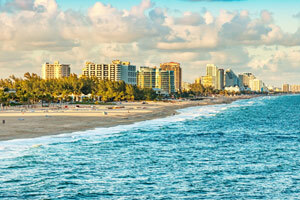 Ft Lauderdale Beach Park is an 18 minute drive from the resort. A quaint, vibrant Mexican-style hacienda, the Blue Seas Courtyard welcomes you with overflowing flower pots, cheery orange and yellow pool chairs and umbrellas, and a sunny warmth newer places can’t often match. Owned and expertly run by Marc and Cristie since 1972, it’s the only resort in Lauderdale-by-the-Sea to have earned the TripAdvisor Hall of Fame Award. (That’s what six consecutive years of glowing guest reviews will get you!) It’s an easy 50 steps to El Prado Beach, and a one-block stroll down El Mar Drive to the lively village square. The heated outdoor pool is tucked into the palmy patio area, surrounded by painted Talavera frogs and tropical birds. Practically every surface and corner holds a colorful reminder of colonial San Miguel, Mexico, and the owners just keep adding more. The sprawling exterior is all classic terra-cotta roof tiles and stucco walls, spiffed up with painted tile insets and mounted fountains filled with flowers. Inside each spacious studio, you’ll find even more art stenciled on the walls and a full kitchen for making simple meals. The grocery store is walkable, so round up some bag-carriers and stock up for your stay. Up early? As soon as you hear the coffee maker beep, pour a mug and step out onto your sunny patio, listening to the birds chirp away. Gather your crew back there later on in the evening with cold drinks and a deck of cards. After a day on the beach, it’s all the entertainment you’ll need. Lauderdale-by-the-Sea is a hidden gem, one of the few remaining laid-back “Old Florida” resort towns – no cruise ships, crowds, high-rises or traffic snarls. The buzzing nearby square is where the entertainment action is. Join in – there’s nearly always something going on that’s worth checking out: live music, dining, dancing and games. If you’re spending the day at the beach, rent equipment from a local shop and try a new water sport like windsurfing, skim boarding or kite surfing. Or get rods and reels for the kids, and let them try their luck fishing off the edge of Anglin, the main pier. Built by the town’s founding family, it’s a local landmark, offering spectacular views of the coastline. Visit either of the two dive shops to get set up with gear, and go explore the renowned underwater coral reefs here in the Shore Diving Capital of South Florida. Want to get a workout in? Join the locals on foot, bikes or skates, cruising around the two-mile oval track with El Mar Drive ocean views. Or venture a little further and take a Jungle Queen Riverboat cruise, or check out the Thunderbird Swap Shop, a car museum and flea market all in one. - Front desk is open 9:00 AM-3:00 PM daily. For late arrivals, resort stuff leaves an envelope with keys at the front desk, which guests must pick up prior to going to their residence. For more details please contact the property using information on the booking confirmation. In the Yachting Capital of the World, water sports abound. Go paddleboarding at Fort Lauderdale Beach, take a canoe through Birch State Park, or book a fishing charter at one of the marinas. Check out the Riverwalk Arts and Entertainment District for shopping and fine dining.